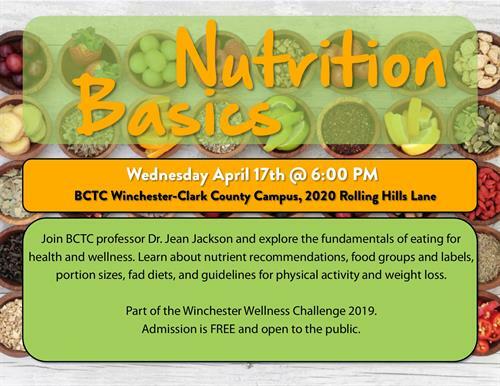 Join Bluegrass Community and Technical College professor Dr. Jean Jackson and explore the fundamentals of eating for health and wellness. Learn about nutrient recommendations, food groups and labels, portion sizes, fad diets, and guidelines for physical activity and weight loss. Part of the Winchester Wellness Challenge 2019. Admission is FREE and open to the public.